Back from the Holidays! How was everyone's break? I was actually sick the entire time unfortunately. The combination of a night of caroling, long workday and then drive straight to Orlando knocked me out for the entire Christmas break. I sat on the couch the entire time in my new snuggie, reading the TrueBlood books and taking meds, lol. Because of that, no post yesterday :( I'm still trying to recover so in the meanwhile, so I'll show you a look I created a few weeks ago. I wanted to use my 96 palette from http://www.starsmakeuphaven.com/ so that those of you with similar palettes could recreate the look. 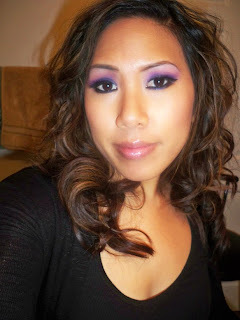 I also feel better when I go back to old palettes I haven't used in a while :) I wore this look during a shoot. I like to have my makeup done for the most part when I do clients...that way they'll have a preview of my makeup artist abilities. Afterward, I wore this look on a trip to target for Christmas ornament shopping. I caught a glimpse of myself in a mirror in the bright store lights and whoa this look was bright in person, lol. I'm going to try and upload a new video this week. In the meantime, thanks for sticking with me. Ciao Bellas! FTC Disclosure: I received the 96 palette from the company and have reviewed it in a past entry. I have not been paid to write this post and am not affiliated with the company. LOVE the look and LOVE your hair! I feel like bright colors look awesome on you! Sorry to hear you were sick during Christmas, pooper! I got the flu once during Christmas when I was younger, stunk. Heehee. My boyfriend got me a pink Snuggie for Christmas. It is simply the bomb diggity. I like this FOTD. You rock them purples like a hurricane. oh my goodness, you look so beautiful with this look. I love it. always gorgeous Ren. When I grow up in my make-up I wanna be just like you! 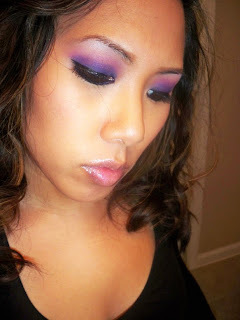 I so love using colours and this is a fun twist on such a flirty look!